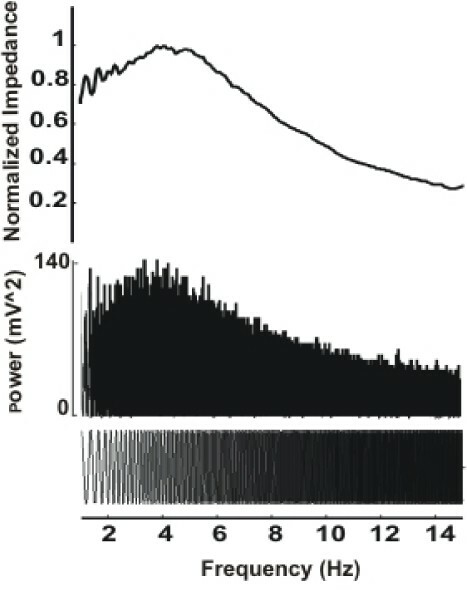 Interactions between passive membrane properties and voltage-dependent ionic conductances have been shown to generate membrane resonances near the resting potential . A certain percentage of cortical neurons preferentially respond to low-frequency (delta-theta band) oscillatory input. Changes in resonance properties of single cortical neurons would be expected to affect firing patterns as well as network synchronization and may underlie some forms of pathologic oscillations such as in epilepsy. Traditionally, a continuously-varying sine wave current input (ZAP) has been used to probe for frequency preferences of neurons. Here, we extend our analysis beyond the ZAP method by employing first and second-order Wiener kernel estimation techniques to the problem of characterizing cortical pyramidal neurons. Two types of stimuli (ZAP and noise) were used to characterize mouse deep-layer cortical pyramidal cell input-output response profiles. All recordings were performed using whole-cell current clamp techniques. ZAP stimuli were used to determine frequency response curves (FRCs) for the neurons at varying membrane potentials; and, noise stimuli of varying maximum frequency cut-offs and amplitudes were used to estimate the 0th, 1st and 2nd order Wiener kernels according to the Lee Schetzen cross-correlation method . The signal's components generated by each of the Wiener kernels was computed and the variance accounted for (VAF) by each component was determined. Figure 1 shows a representative ZAP 1–15 Hz input trace (bottom), the corresponding demeaned squared output signal (middle) and the corresponding smoothed normalized impedance curve (top). In this example, the impedance curve reflects the peak in output power which indicates a resonant frequency of about 5 Hz. Figure 2 depicts an output trace during current injection with noise (red) and the relative contributions to the output determined from estimates of the combined 0th and 1st order (blue), or 0th, 1st, and 2nd order (green) Wiener kernels. Here, the VAF by the 0th plus 1st order kernels was 81.3% and the VAF by the 0th, 1st, and 2nd order kernels was 83.6%. Zap Input, Output Power, Impedance. Variance in Output Accounted for by 0th, 1st, and 2nd Order Wiener Kernels. Our results confirm the findings of previous studies showing the presence of low-frequency resonance in cortical pyramidal cells that is strongest near the resting potential . 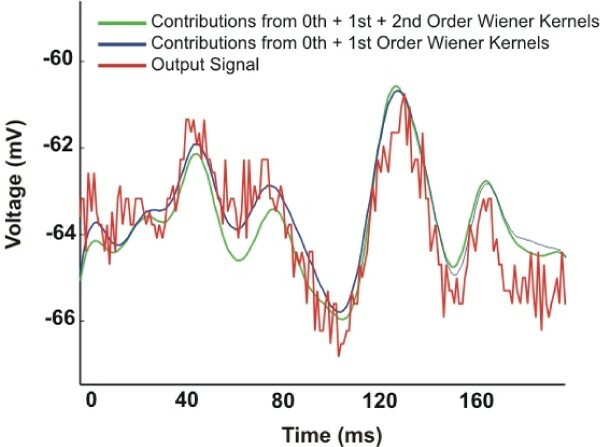 Computing the second-order Wiener kernels provided only minimal additional utility for characterizing subthreshold response profiles; thus, near rest, these neurons can be characterized by a first-order system. This work was supported by the Falk Foundation, the Linn family, the ARCS Foundation, and the Epilepsy Foundation.